Ok, it's official. The forums hate me. Your not alone...took me 6 tries and 2 browsers to post something. And replying to a post is just as frustrating. All I can say is.....Egads! 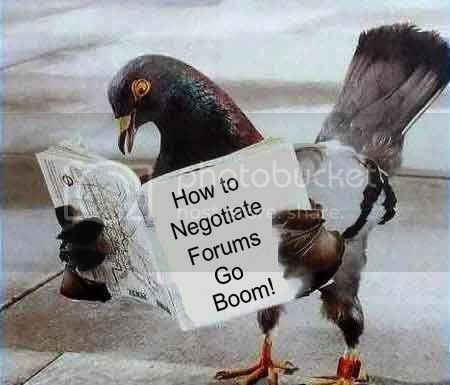 Forums go boom! No way I'm suffering endless Egads again. Time to leave the forums (from a posting point of view) for a few weeks (sorry, Bara ). Same here. I bet Bara fogot to feed the sever-powering 'Mice on running wheels' again. The SD folks were all so bereft over the "Lost" finale that they needed extensive counseling. Give it a few days (and some Prozac) and things will be back to normal. I actually got one of the Egads!-bombs just yesterday. I wouldn't call it "frequent" but it just wouldn't stop and was very distressing. I think I need counsling. Where's the "the Forums hate me" support group? Seems to me like there's some sort of weather going on. I've had long stretches where pretty much every other thing I tried to post went boom a time or three, but I've had no booms at all recently. Some really sluggish processing, but no booms. Early morning UK time the forum is totally unpostable to. I usually click on the forum here, then go browse several other sites while the page loads. Despite any cosmetic changes, the site has been slow for the last eight years and will be slow for the next eight years. Just take it for what it is. For quite a while now, using the Back command in FireFox worked when I forgot to copy before posting and I mostly use it as my workaround now. The trick there is knowing to put the tab in the background, ignore it for a while, check recent posts to see if you actually posted even though you got a Boom message, and then try posting again if it looks like your Boom wasn't one of the ones that invites double posts. Needed with Microsoft Internet Explorer but with Firefox, i simply need to click "<-" and i am back to the reply page with my text intact !!! We don't haaaavee a pub here. usually click on the forum here, then go browse several other sites while the page loads. Despite any cosmetic changes, the site has been slow for the last eight years and will be slow for the next eight years. Just take it for what it is. It just happened to me trying to create a new thread in Support. How TF are you supposed to create a new thread? Your avatar is too awesome to allow it. Yeah, I've been having this problem as well. I think the only thing to do is ride it out, sadly.